Kristof and WuDunn are available through Boston-based American Program Bureau. 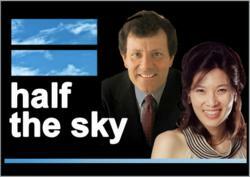 A husband-and-wife team, Pulitzer Prize-winning journalists Nicholas Kristof and Sheryl WuDunn are co-authors of the best-selling 'Half the Sky: Turning Opportunity into Oppression for Women Worldwide,' which was the basis for a four-hour television event airing on PBS October 1 and 2. Taking viewers on a journey across the globe, 'Half the Sky' shares the stories of courageous individuals who are working to confront the global oppression of women. Both Nicholas Kristof and Sheryl WuDunn are available to speak to audiences across the country on the global women's issues explored in 'Half the Sky,' including healthcare, education, economic empowerment, and gender-based violence. They are represented by Boston-based American Program Bureau. Kristof and WuDunn have shared their message with organizations and universities across the globe, speaking out against human rights violations and urging action. Organizations interested in bringing Nicholas Kristof and/or Sheryl WuDunn to speak in front of their audience should contact the American Program Bureau at 800-225-4575.